Download the full report, foreword and executive summary, and the base report. In "Pre-K and Charter Schools: Where State Policies Create Barriers to Collaboration," authors Sara Mead and Ashley LiBetti Mitchel examine thirty-six jurisdictions that have both charter schools and state-funded pre-K programs to determine where charters can provide state-funded pre-K.
Thirty-five states and the District of Columbia have both state-funded pre-K and charter laws. Of those, thirty-two have at least one charter school serving preschoolers. 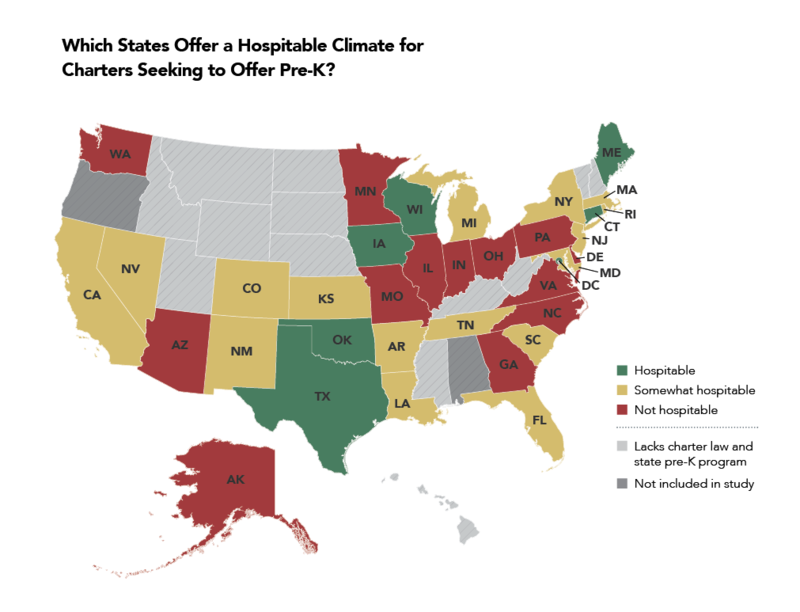 Charter schools in all but four states face at least one significant barrier to offering state pre-K. Nine have statutory or policy barriers that preclude charter schools from offering state-funded pre-K; twenty-three other states technically permit charters to offer state-funded pre-K but have created practical barriers that significantly limit their ability to do so in practice. The most common practical barriers include low funding levels, small pre-K programs, barriers to kindergarten enrollment, and local district monopolies on pre-K funds. Ensure that the state's definition of a "charter school" includes pre-K in the activities or grade levels that charters are permitted to offer. Establish clear policies that allow charter schools operating publicly funded pre-K to enroll the children served by those programs directly into their kindergarten classes. Make certain that charter schools have equal access to state pre-K funds. Include pre-K in the federal definition of "charter school." Ensure that federal preschool programs, including Head Start, provide charters equitable access to funding. NOTE: This report was produced for The Thomas B. Fordham Institute and was made possible through the generous support of the Joyce Foundation, the Walton Family Foundation, the National Alliance for Public Charter Schools (NAPCS), and the Thomas B. Fordham Foundation.